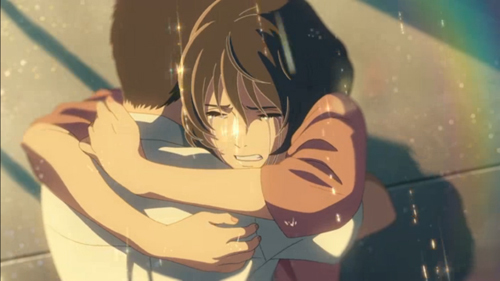 “The Garden Of Words” marks animator Makoto Shinkai’s fifth major work, and the only major criticism I can muster is that he doesn’t seem to like producing feature-length projects. Of the five, only two, “The Place Promised In Our Early Days” and “Children Who Chase Lost Voices,” run long enough to qualify as feature length. I’m wondering if he prefers the compactness of shorter stories, but it certainly has no effect on his ever-expanding mastery. “Children Who Chase Lost Voices” was a fantasy story (with some science-fiction trappings thrown in) and allowed for plenty of fantastic creatures and landscapes. 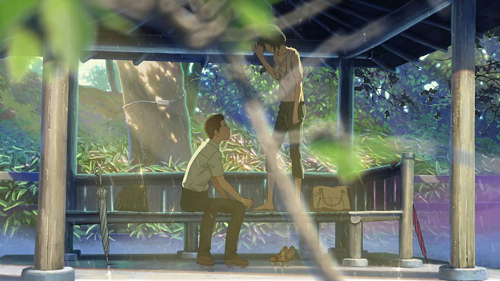 “The Garden Of Words” returns to an earlier idea of Shinkai’s, first expressed in his “5 Centimeters Per Second,” to tell a story with neither science fiction nor fantasy elements. In a genre, anime, where such elements usually dominate, this is a bold move. The story opens with a teenage boy, Takao Akizuki (voiced in Japanese by Miyu Irino, in English by Patrick Poole), who lives with his mother and older brother. Takao is bright and ambitious, but something of a misfit at school. His ambition is to become a shoemaker, slightly odd in an era of mass-produced footwear. But Takao spends all of his spare time studying the intricacies of his chosen trade. He even acknowledges that he lacks natural talent and will have to work hard and make many mistakes, before achieving mastery —unusually insightful for one so young. Takao decides to skip school one day — actually, he skips school fairly frequently, much to the chagrin of his family and teachers. This rainy morning, however, he passes through a local park and hides under a shelter to sketch shoe designs. There he finds Yukari Yukino (voiced by Kana Hanazawa and Maggie Flecknoe), a woman in her 20s, drinking beer. Yukari Yukino is a mysterious person, perhaps wary of the age difference between Takao and herself. She confounds the young man by speaking in strange verse which turns out to be a tanka — an ancient Japanese poetry form, usually consisting of five lines in varying lengths. To convince Yukari to speak back to him, Takao must search his memory for the rest of the tanka. Then he must put up with her odd and evasive behavior, even as he works to befriend her. Yukari has secrets, and as the anime’s 46 minutes roll on, Takao discovers a few. The revelations will make him unpopular, even bullied, at school, where he’s already not terribly popular. The toxic nature of the schoolyard rumor mill threatens to overwhelm him. “The Garden Of Words” is available on DVD and Blu-ray disc. Check your local video store for availability.